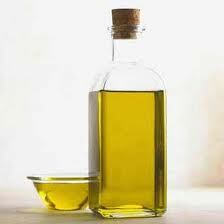 I have come across many natural websites that sing the praises of the oil cleansing method(OCM). I'm a big believer in most things natural, but I was a skeptic when it came to accepting the hype about OCM. If you are unfamiliar with the OCM, it is basically when you use a mixture of carrier oil and castor oil to clean your face instead of soap. I will describe the exact process in more detail in a minute. Because of my hormone imbalance and PCOS(I am working on healing this with traditional foods, herbs, and natural living. Read about this journey here ), I suffer with oily skin and terrible acne breakouts. This issue is slowly resolving as I rid my body of toxins, but I still deal with acne on a daily basis unfortunately. I have used the natural skin care recipes at Easy Aromatherapy Recipes for sometime--my staples being the tea tree oil facial cleanser, oily skin toner, and acne cream. These natural, homemade items(combined with diet changes) vastly improved my skin better than any chemical product. Using oil to clean my oily face seemed like it would be a recipe for disaster. However, after constantly reading about the OCM, I became curious enough to bravely dive in and experiment. You can vary these ratios to match your unique skin needs. Finding your perfect combination of oils will probably take a little bit of trial and error, so start with very small batches. Those with dry skin will want less Castor Oil. Those with oily skin will want to blend in more. I would personally use no higher than 30% castor oil though. I only use the OCM every other night, as this method works best if used only 3-4 times per week. Mornings and other evenings, I clean my face with a microfiber cloth with natural silver fibers. You can also do the following: take a hot wash cloth and hold it over your face until it cools, repeating a few times. Pat dry. To do the OCM you will take a few drops of your castor oil/carrier oil mixture and massage gently onto you face with your fingertips. Then place a hot wash cloth onto your face until it cools, repeating a few times. Rinse your face with water and pat dry. Make sure you are taking the time to steam your face well each time. I mix and store my mixture in a clean flip-top bottle for convenience. I suggest cleaning your bottle thoroughly with hot soapy water or in the dishwasher. You want to be extremely cautious in introducing bacteria to the bottle. When I feel the need to exfoliate, I use plain baking soda or I add a small amount of sugar and rub with my oil mixture onto my face. Although I did not experience any type of transitioning period with my skin, it is important to note that this is a possibility. As your skin adjusts to a new routine, it may react by breaking out or getting "worse" before it gets better. Don't freak out as this is only temporary. Once your pores purge themselves, they will begin functioning properly again. Although it will take a few weeks or more to reach your goal, you should notice a huge difference in your skin after the first deep oil cleansing. Give your skin a few days to adjust and adapt. The new oil coming from your skin is actually a good sign, and it will eventually balance out.